The DigiComp HD color standards are precisely manufactured for crisp, clean separation of the foreground/background in digital compositing – resulting in little or no post-production "touch-up" needed. Rosco DigiComp HD paints are specially formulated to provide the proper luminance and RGB values for optimum operation of all digital compositing systems. Surface PreparationSurfaces should be clean, dry and free from dirt and grease. Prepare surfaces using an appropriate primer. If painting a new plaster surface, prime wall with a primer/sealer designed for raw plaster. For best results use DigiComp HD over a white primer, such as Rosco Tough Prime White. Make sure the prime coat is adequate and that it results in a flat and even surface. Any blotchy areas or roller marks may bleed through and cause an uneven finish coat. ApplicationStir contents very well before and during use. Commercial shaking one day before use is recommended. Rosco DigiComp HD paints come ready to use straight out of the can. Check your batch numbers. Different batches of paint may vary slightly in color. Combine different batch numbers together to maintain color consistency throughout your project. Using a 3/8” nap roller, apply in thin, even, uniform coats, with overlapping strokes - making sure to keep a wet edge. Change roller direction often to avoid patterns and streaking. An appropriate airless spray (HVLP recommended) system may also be used. Make sure to keep the nozzle of the sprayer equidistant from the surface during application. 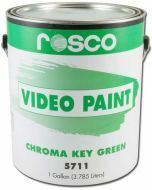 For full application instructions, please see Rosco's How To Paint Your Wall/Cyc with DigiComp HD document, or watch the video. Average Dry Time30 minutes to one hour, depending on temperature and humidity. Allow first coat to dry completely before applying the second coat. 6.56" x 6.56" x 7.56"